Do you also have problematic fine hair? Fine hair can easily look unkempt or flat when it is not well styled. I found that one of the easiest ways to pump up the volume around my roots and get some glamour through the strands was to curl my limp, fine hair. There are hundreds of versatile looks to be made using a curling iron! No, fine hair requires tender, loving care and heated styling tools can easily fry fine hair. I badly need the lovely curls but it should be gentle on my hair and worth the effort! ​ I went on the search for the best curling iron for fine hair. So, Which Model Truly is the Best for Fine Hair? Finding the perfect curling iron can be difficult—especially if you have high-maintenance, fine hair! Lucky for you, we’ve created a list of our top five favorites. Here are our five finalists in our search to find the best rated curling iron for fine hair. Think pearly-pink with the Remington Pearl Ceramic Curling Wand! It features a ceramic wand infused with real pearl to give you one of the smoothest gliding surface for a silky lustrous hair. This model is great for adding volume to limp, fine hair without making it look stringy. That’s because this cone wand tapers from a circumference of 1 1/2 inches at the base down to 1 inch at the end. With this shape, you can choose how big you want your curls, or use the entire length of the wand on each strand to achieve a flattering balance between volume at the roots and curls at the tips. You can use this curling iron for fine hair every day because it is gentle on hair. It is made of ceramic infused with real pearl, which don’t only go easy on hair, but also add shine and luster to your final look. Are you in a hurry to get out the door? No worries, this curling wand only takes about thirty seconds to heat up, and can go from 266° up to 410° Fahrenheit! You can control this easily with a digital monitor displaying the exact temperature of your curling iron. The temperature lock feature maintains consistent heat once the wand reaches your desired temperature and beeps. It has a swivel cord give your good flexibility to style and curl at any angle. A heat protective glove is also present in the kit to protect your hair and hand while your style. And even if you leave in a flurry, this curling iron shuts off automatically after 60 minutes, so you can carry out your day worry-free and glamorous. Check out below video to see it in action. Could this be the all-time best ceramic curling iron for fine hair? Maybe, but we’ve got more! If you prefer a curling iron with a clip over the barrel to a free-handed curling wand, then the Hot Tools Curling Iron might be the best curling iron for your fine hair! Unlike the ceramic-pearl mix used in the Remington, this curling iron features a 24 karat gold-plated spring type barrel. This composition allows the barrel to heat up quickly and evenly for flawlessly smooth, bouncy curls. The curling irons are equipped with a patented Pulse Technology that heats them fast and a Stays Hot technology for maintaining constant temperature. Yes, the gold-coated barrel makes hair look sleek and healthy, but it does not add much shine to your hair as a ceramic barrel would. Regardless, this tool is in the running for one of the best curling irons for fine hair because the surface is gentle on heat-sensitive, fine hair. Do you want more heat for more defined curls? This model can reach 430 degree Fahrenheit (220 degree Celsius) of heat from 280°F ! Even when the curling iron is this fired up, you won’t burn your fingers guiding the curling iron through your gorgeous locks thanks to an extra-long cool tip. This tip is long enough to pinch between your thumb and fingers, and has a soft touch grip allowing you utmost control while curling your hair. A rheostat control dial lets you adjust the heat settings for different hair types. It has a heavy duty swivel cord and comes with a foldaway safety stand for easy storage. One bonus feature that sets this curling iron apart from the crowd is that it has the ability to learn and remember the temperatures you most commonly use on your hair for quick adjustment times. Look out Remington Pearl Ceramic Curling Wand—you’ve got some close competition. Does the X﻿﻿﻿﻿﻿﻿﻿﻿t﻿﻿ava Twirl Conical Curling Wand surpass the Remington as the true best curling wand for fine hair? Well, that all depends on how much you like thin conical wands, ceramic finishes, versatile heat settings, digital controls, practical cool tips, automatic shut-off functions, carry case and record-breaking, long-lasting curls (we like them a lot!). Unlike the ceramic-pearl curling wand by Remington, this particular curling wand ranges from 0.5 to 1 inches in circumference, so you can choose between tight, helix curls or big bouncy curls, or combine them to pump up fine hair at the roots and glam at the tips! Not to mention, the wand has a ceramic finish to add shine to your ‘do. The iron features an ionic ceramic and tourmaline technology to give you smooth, frizz-free silky curls while protecting your hair from damage. 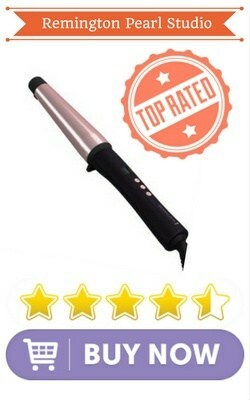 The Twirl is not just one of the best curling irons for fine hair, it’s actually made for all hair types! Yes, this curling wand has 22 unique heat settings varying from 200 to 410 degree Fahrenheit, so you can use heat in healthy dosages. These temperatures can be adjusted for using a cool digital screen, which displays the exact temperature of your wand. It makes use of a ceramic heater technology to maintain a consistent temperature for achieving the desired styling. No matter how hot it gets, keep your fingers unburned by holding the iron by the comfortable hand grip and the cool tip! A 60 min automatic shutoff prevents any damage from over heating. But the real reason this device is in the running for best ceramic curling iron for fine hair is the longevity of the results it produces. Curls last hours on end without falling when you stay with this curling iron! Okay, here’s a contraption you might not be familiar with, but we promise you’ll love the way it makes your hair look and feel! The Homitt Ceramic tourmaline curlers don’t quite look like your average curling iron—rather than being shaped like a straight line, it looks more like a spacecraft. But, don’t judge a book by its cover because this curling iron is great for styling fine hair. 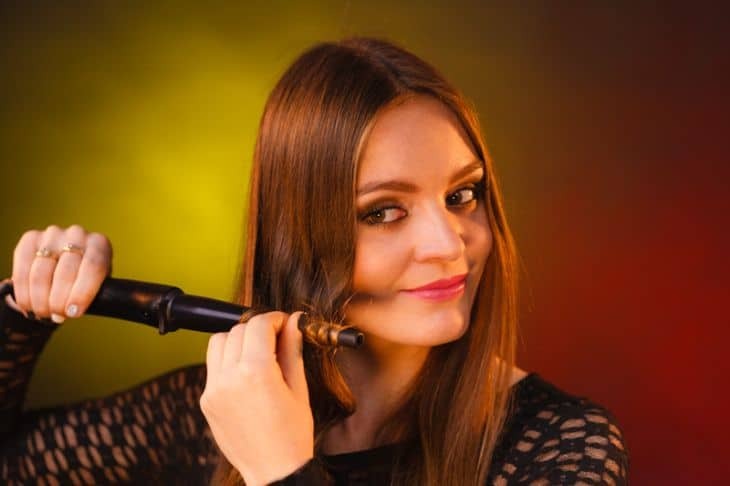 The reason for the odd shape of the Homitt curling iron is that within the pod there is a spray nozzle that, when activated, releases a fine mist of water to protect from dry hair or frizz. The fine water spray protects your hair from frizz and drying. Make sure to fill the removable water tank with pure water if you are using the spray option. Another cool feature is that you can select a pre-programmed option controlling the direction of your curl (you’ll never confuse yourself in the mirror again! ).You can select from 4 curling times (0,8,10,12 seconds) and choose the direction of curl. The intelligent automatic curling feature lets you choose between “R” for right-facing curls, “L” for left-facing curls, and “A” for automatic, which creates more natural-looking curls. The LCD screen displays the current time (so you can be surprised just how quickly your hair transforms into curls! ), the exact temperature (this one can reach from 350 degrees to 450 degree Fahrenheit, but a range between 350 and 370 degrees is gentle enough for fine hair), and the curl direction currently selected. An intelligent hair protection system will come in handy if your hair gets stuck inside the curl chamber. An auto retrieval process will release the hair safely. The Homitt is light weight and also has a nice swivel cord making it easy to hold and use. This model may not look like your average curling iron, but it’s doubly effective! That’s why this Homitt made it into our group of top five finalists for best curling iron for fine hair. Presenting the BaBylissPro Professional Mira Curl! Like the Homitt, this curler has steam technology to create long-lasting, well-formed curls and rehydrate heated hair to prevent frizz. In fact, the brand claims that the new optional Miracurl Steam technology can produce 20% higher definition of curls and 50% better formation of curls. Not to mention, your hairdo should last for up to 24 hours without falling or drooping. The curl chamber on this BaByliss is made of Nano-titanium, which helps to add shine and a silky finish to curls. Your hair will look and feel smooth after running through this device! Also, the device features a MaxLife Pro brushless motor that can lasts for up to 25 times longer than the leading competition! It can stop automatically and reverse the direction if your hair gets jammed in the chamber. One of the nice things about this curl machine is that it creates consistent curls—each curl looks identical and flows together like natural hair. The Miracurl model also have settings that control the direction of the curl (left or right) for you. It offers 3 heat settings of 375, 410 and 450 degree Fahrenheit and 3 timer settings (8,10,12 seconds) for creating a variety of curl styles. However, with this machine it is easy enough to create alternating curls with a direction control switch, manually. It comes with an additional water chamber, salon length swivel cord and a cleaning tool. It also saves power using an auto shutoff and sleep mode features. The BaByliss makers have also provided a small styling guide within which you can find the techniques for creating different hairstyles using a curling machine. If you have fine hair and would prefer voluminous, bouncy curls, you may want to consider getting a curling iron. But before you stop by the neighborhood beauty supply store, there are some things you should know about curling irons—especially if you have delicate, fine hair. Type of Curling Iron – There are 3 different types of curling irons you can purchase. The first type is the Spring curling iron that have a spring to automatically close the clamp on the iron which is used to create curls. The clamp is released using a convenient thumb lever. Clipless wand type is another popular type of curlers ​that have no clip or clamp to hold the hair. You need to manually wrap hair around the heated barrel to create curls. Heating element- The curling iron barrel is made up of different heating elements similar to that of a flat iron or blow dryer. The common type is ceramic coated irons that come in variations like ceramic ionic or ceramic tourmaline. The ceramic based heating elements produce infra- red waves that is used to heat the hair. The ionic or tourmaline elements charge them with negative ions to create a frizz-free silky hair. Titanium based irons have the capability to generate heat very quickly and also reduces the weight of the curler. Some irons have metal barrels that are gold plated for even heat distribution for a smoother glossy hair. Temperature Settings - One thing to look for is temperature controls. Some curling irons can reach a broader range of temperatures than others, and some models can be more finely tuned than others. If you have heat-sensitive fine hair, you should find a curling iron with a wide range of temperatures (including cooler temperatures, somewhere between 350 and 370 is appropriate for fine hair). Temperature lock capability is useful for maintaining desired temperatures. Barrel - Another point to consider before making a purchase is how thick the barrel of the curling iron is. If you have fine hair, it will be harder to hold large, loose curls at the ends of your hair (thanks, gravity!). Ideally, bigger curls at the crown, and slightly tighter curls towards the bottom of the hair creates volume without overwhelming your face, so a tapered barrel can be a major benefit. Common barrel sizes range from .75 inch to 1.5 inches. Steam - Some curling irons have a water chamber to generate steam while you curl. The steam prevents hair from drying out and better curl formation. Extras- Some of the other useful features to look for include Auto cutoff mechanism, a good long swivel cord and heat protection gloves. After careful consideration, we have decided that the Remington CI9358 T| Studio is the best curling iron for fine hair. This inexpensive hair wand is ideal for fine hair because it has all essential features and produces nice voluminous curls for fine hair. Not to mention, the tapered shape of this curling iron makes it easy to create tight, bouncy curls and add volume to your crown at the same time! Also check out some good airbrush makeup kits here.